Plastics|SA used its participation in Sustainability Week (5-7 June 2018), World Environment Day (5 June 2018) and World Oceans Day (9 June) to raise awareness about the importance of keeping plastics pollution out of the environment. Africa’s premier green economy forum, Sustainability Week, took place last week (5-7 June 2018) at the CSIR International Convention Centre in Tshwane. One of the major themes at this year’s event was the sustainable development in Africa. Plastics|SA hosted a “Beat Plastic Pollution” Workshop on the opening day of the Week, which attracted much local and international attention. “The issue of tackling plastics polluting the environment is at the top of the global agenda of the packaging industry, governments and environmentalists around the world. There is a surging momentum in global efforts to address this issue, and Plastics|SA is adding its voice to the calls for the implementation of proper waste management systems and responsible human behaviour in order to see less plastics ending up in the environment and our oceans,” Steyn said. This sentiment was echoed by Cecilia Njenga of the UN Environment, who told delegates attending the workshop that the African Union has set an ambitious aspiration for African cities to recycle at least 50% of generated waste by 2021. “However, if we are to reach this objective, we are going to need policymakers, industry role players and private citizens to work together in order to rid the African continent of its litter problem,” Njenga said. The Africa Waste Management Outlook compiled by Prof Linda Godfrey, Principal Scientist at the CSIR on behalf of the UN Environment was also launched during this event. Godfrey confirmed that Africa has become a dumping ground for waste – particularly hazardous waste – which often originates from developed countries. “Currently only 4% of the waste generated in Africa is recycled. The good news, however, is that a growing number of governments are taking action and demonstrating that all nations, whether rich or poor, can become global environmental leaders,” she implored. 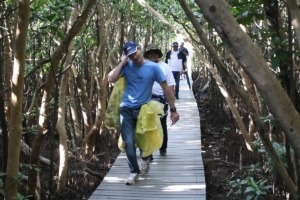 Plastics|SA teamed up with SAGE foundation and the KZN Marine Waste Network in Durban to host a #WorldOceansDay cleanup at the Beachwood Mangroves in Durban, KwaZulu-Natal. 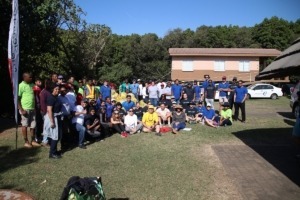 More than 120 people volunteered their time and effort to pick up litter in the mangroves situated at the mouth of the Umgeni River in Durban North. Beachwood Mangroves Nature Reserve is a 76-hectare reserve with the largest population of mangrove trees in the Durban area, providing an important living, breeding and feeding habitat for birds, fish and other creatures. “The mangroves are a nursery area for many species of fish which eventually return to the ocean as adults. It is therefore important to keep this area as clean and litter free as possible to ensure that the marine animals do not ingest any broken down pieces of plastic,” Steyn explained. The environmental effort enjoyed the support of SAGE Foundation, Ezemvelo KZN Wildlife, Mitchell Cotts (Grindrod), Sheet Street, uShaka Sea World, Department of Environmental Affairs (DEA), Durbanites Against Plastic Pollution (DPAPP) and the Durban Green Corridor. In addition, various other beach clean-ups took place on the day along the KZN coastline, including Treasure Beach, Bluff (sponsored by WESSA), Virginia KZN Beach Cleanup (sponsored by SPAR).